Start off your visit on the 22nd (Mon): contemplate in the serene atmosphere at St. Stephen's Basilica (Szent Istvan Bazilika), test the waters at a local thermal spa, then examine the collection at Institute for Musicology, and finally take in the exciting artwork at Koller Gallery. To find traveler tips, photos, more things to do, and more tourist information, you can read our Budapest online trip itinerary maker . Washington DC, USA to Budapest is an approximately 15-hour combination of subway, bus, and flight. You can also do a combination of train and flight; or fly. The time zone changes from Eastern Standard Time to Central European Time, which is usually a 6 hour difference. Plan for a bit cooler temperatures traveling from Washington DC in April, with highs in Budapest at 63°F and lows at 40°F. Wrap up your sightseeing on the 23rd (Tue) early enough to travel to Presov. Prešov is a city in Eastern Slovakia. Military and historical Museum of Svidnik and The Andy Warhol Museum of Modern Art will appeal to museum buffs. 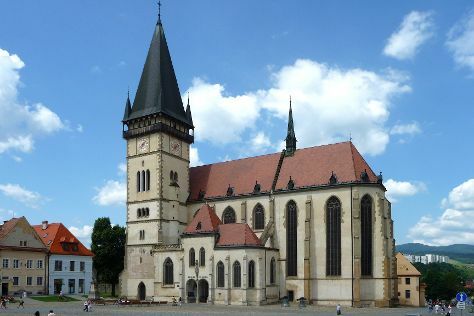 Your cultural itinerary includes sights like J & J Ostrozovic and Cathedral of St. Elizabeth (Dom svatej Alzbety). Get out of town with these interesting Presov side-trips: Bardejov Spa (in Bardejovske Kupele), Bardejov (Fountain, Bronze statue Kata, & more) and Kosice (Miklus Prison, Kaplnka svateho Michala, & more). There's more to do: see the interesting displays at Andy Warhol Museum. Make your Presov itinerary with Inspirock to find out what to see and where to go. Drive from Budapest to Presov in 3.5 hours. April in Presov sees daily highs of 61°F and lows of 41°F at night. Wrap up your sightseeing on the 26th (Fri) early enough to drive to Strbske Pleso. Start off your visit on the 26th (Fri): explore the activities along Jazierka lasky. For where to stay, more things to do, reviews, and more tourist information, read our Strbske Pleso trip itinerary builder app . You can drive from Presov to Strbske Pleso in 1.5 hours. Alternatively, you can take a train; or take a bus. Cap off your sightseeing on the 28th (Sun) early enough to travel to Budapest. On the 28th (Sun), pause for some photo ops at Hősök tere, then examine the collection at House of Terror Museum, then admire the landmark architecture of Matthias Church, and finally don't miss a visit to Fisherman's Bastion. To find photos, other places to visit, and other tourist information, read our Budapest trip itinerary maker site . You can drive from Strbske Pleso to Budapest in 4.5 hours. You will have some time to spend on the 29th (Mon) before leaving for home.